Clinically, hip displaysia manifests itself in a couple ways. One is a severe form that typically afflicts younger dogs & is usually characterized by obvious pain & lameness. The other is the chronic form with more gradual onset of visible signs such as mild, intermittent pain, stiffness & restricted range of motion in the hips as the dog ages. Many times this chronic form can be asymptomatic. My husband and I are not breeders. We do not breed our dogs. We do, however, PennHIP our dogs. In 10 years of owning multiple Leos, it’s helped us for lots of different reasons. The ability to have an early indicator of possible problems later is very important to us and in our experience valuable to the quality of life of the dog. 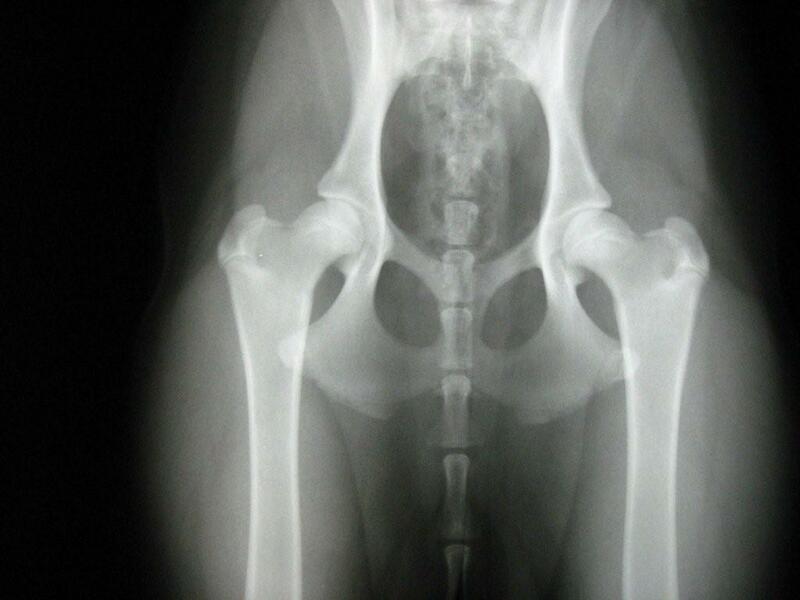 PennHIP scientifically evaluates a dog’s susceptibility to develop hip displaysia. Note that I said SUSCEPTIBILITY, not that it diagnoses it. PennHIP involves special positioning of the dog so the dog’s “passive hip laxity” can be accurately measured. The passive hip laxity refers to the degree of looseness of the hip ball in the hip socket when the dogs’ muscles are completely relaxed. Research’s shown the degree of this laxity is an important factor in determining susceptibilty to develop degenerative joint disease (DJD) later in life. 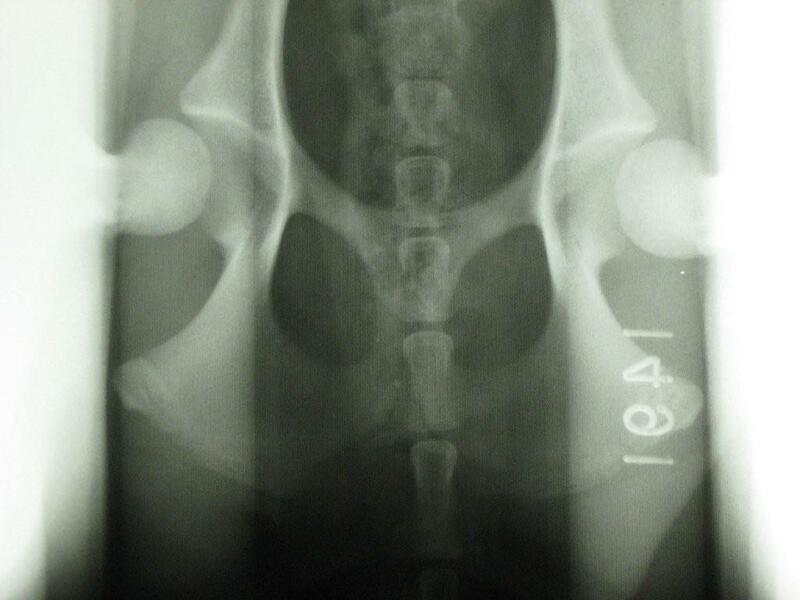 DJD evidence on x-rays is the universally accepted confirmation of hip dysplasia. This passive hip laxity is objectively measured and quantified and called the Distraction Index (DI). It’s a unitless number between 0-1. A smaller DI means less laxity (tighter hips) and less susceptibilty for degenerative joint disease. A DI of .50 is interpreted to mean the femoral head is 50% displaced from the acetabulum (the ball is displaced from the socket). DI has been shown to correlate strongly with the probability of developing hip DJD. They further apply the DI to the distribution of a certain breed. Meaning the individual dog is compared only to other dogs of the same breed. This then gives a profile of how the individual dog fits with the whole breed and allows breeders to better chose for improving the breed’s hips over a shorter time. To us, as non-breeders, we care mostly about the DI (althouth adding to the database to help breeders improve breeds is also important). Our German Shepherd, Mara, was PennHIPPED at 6 months. There’s an increasing risk of developing DJD as the Distraction Index increases. Low risk is close to .30 and high is close to .70. Her left DI was .61, her right was .57. We did a prelim OFA on her at a year. That report showed slight subluxation (dislocation) and unilateral pathology of her left hip. Her evaluation was called Borderline, which was in line with the PennHIP, only with PennHIP we found out much earlier and were able to change activities and start supplements. Mara was going to be one of my demo dogs for my training business. She was going to be doing lots of Frisbee and jumping, etc. We changed her activities so we’re working on freestyle (canine dancing). Freestyle doesn’t require jumping. She loves dock diving (landing in water is fine, landing on land not so much). She’s showing off some her skill on this blog’s masthead photo. Swimming is excellent non-weight bearing exercise. We joke she’s our speed skater because we keep her thigh muscles built up. We had Tringa PennHIPped when she was spayed. We had some idea things weren’t great with her hips, but that’s hard to tell for sure on growing puppies, especially giant breed puppies. Here is a photo of her x-rays. This is the VD view, the view typically taken for OFA ratings. PennHIP uses this VD view to look for pathology and deformities. Next PennHIP requires a distracted view. The dog is positioned in a special way to apply some distraction to see how much laxity it present. We weren’t overly surprised by her x-rays other than the degree of laxity. Some laxity is good. Some is expected. I like some laxity. Laxity in young pups prevents injuries. But at what point does laxity cross the line into luxation (dislocation)? We had to wait for the results to come back, but we knew it wasn’t going to be good. To my untrained eye, it certainly looked like at least 50% displacement from the socket. After about 10 days, the numbers came back. And they weren’t good. There’s no radiographic evidence of degenerative joint disease at this point, but the risk of developing it is high when the Distraction Index is .70 or above. Currently, there are 202 Leonbergers in the database. She ranked in the lower end of the 10th percentile. Doing the math, that means out of the 202 Leonbergers only about 10 have more laxity (looser hips) than she does. Or looking at it the other way, roughly 190 have tighter hips. What’s this all mean for us and Tringa’s future? She’s already on supplements to help maintain and improve joint health. Her exercise and training have been changed and physical therapy disguised as fun swimming has begun. Hopefully, with careful management and early awareness, we’ll be able to keep her symptom free and comfortable for many years to come.